Lillie McFerrin Writes: Rockstar Bloggers! Lately my writing has been, well, nonexistent. I've had no urge to write, and there are even days where I don't even write in my head! That means little else is going on in there...So...Thankfully two of my awesome, fantastic, creative champion blogging cohorts have come up with things to help me get out of my funk and get my writing mojo back. Check them out! 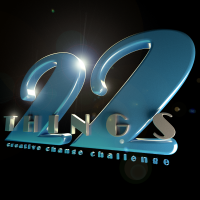 Angie over at Write Me Happy has issued a 22 Things Creative Change Challenge. It's a no fuss, stress free way to see just what you CAN do, and do right now! Anna over at Yearning for Wonderland is hosting a rockstar flash fiction contest. Head over and check out the details and stretch your creativity for Once Upon a Time!! Thank you so much for sharing, Lillie! Thanks Lillie! You're the ROCKSTAR! Thanks for sharing Lillie, I've been in a bit of a funk when it comes to writing too.